Honda’s innovative X-ADV scooter has been a surprise success. Since its launch in 2017, over 7500 have been sold throughout Europe. Its funky look, practicality and fuel economy have made it a popular choice for all types of riders looking for a do-anything mode of transport that’s a little bit different. 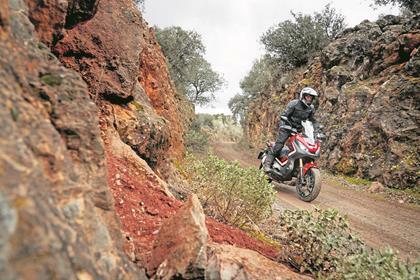 Billed as an adventure scooter, Honda claim the X-ADV has off-road credentials, but with small wheels (17in front and 15in rear), minimal ground clearance and huge weight, its off-road abilities are seriously limited. Where is does excel is its ability to tackle any type of road riding without fuss, while offering good fuel economy and decent weather protection. The X-ADV has undergone changes for 2018 largely centered around electronics and rider aids. 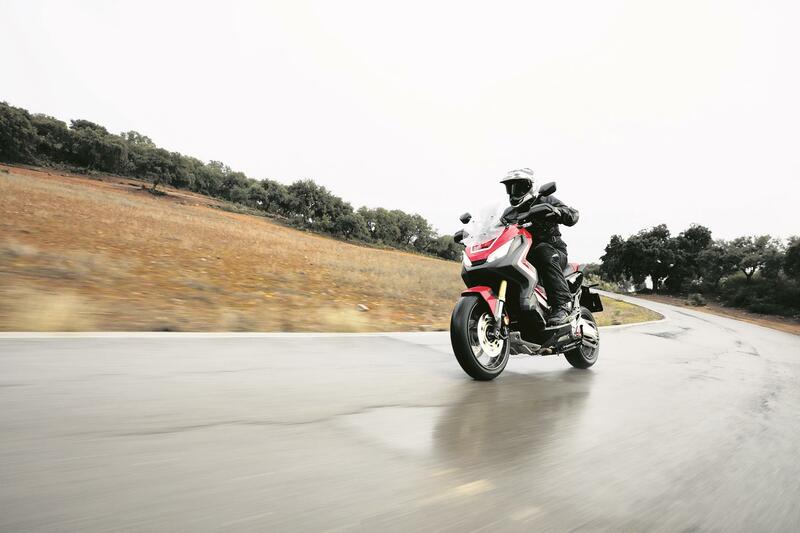 The latest model features Honda Selectable Torque Control (HSTC) which is Honda’s torque/traction control. There are two settings to choose from with default level two designed for road use, and with level one designed for off-road use and allows the rear wheel to spin more. You can also easily switch the torque/traction control off completely. The 2018 version’s engine has also been given a 900rpm boost with the redline now at 7,500rpm meaning there are more revs to play with in each gear. There is also a G (Gravel) button designed for off-road riding that gives additional engine braking, especially useful when going down hill off-road. It is the same system used on the Honda Africa Twin DCT models. The riding position is also relaxed, but despite the bike’s size and length isn’t as roomy or comfy as you might think. If you sit in a conventional position, your knees are quite bent, and if you decide to stretch them out, your legs end up at an awkward angle with all your weight going through your bum. On the road, its performance exceeds expectations. While it may only produce 54bhp from its 745cc motor and weigh a hefty 238kg, it still accelerates briskly and can hold its own in the fast lane. The throttle connection and response are lazy, but the power is ultra-linear and the DCT gearbox is smooth, just as long as you don’t put it under too much load and revs. As you would expect from Honda, build quality is solid. Because of the styling of the bike many of the key components are covered meaning they are protected from the elements and as a result should hold together well. The engine is well proven, reliable and economical making it a user friendly and fun to ride work horse. With claimed economy of over 75mpg, it’s certainly frugal despite offering good performance. With its 13 litre fuel tank it has a theoretical range of well over 200 miles. The 2018 models come in five different colours – Matt Bullet Silver, Matt Pearl Glare White, Grand Prix Red, Candy Chromosphere Red and Digital Silver Metallic. These all cost £9,959. Keyless ignition is a nice touch and the dash has enough info without being overwhelming. Changes for 2018 include two-stage traction control which is easily adjusted via a simple switch and can be turned off. It works well. Read about the 2017-2018 Honda X-ADV in our expert motorbike review here. No owners have yet reviewed the HONDA X-ADV (2018-on). MCN Fleet: What does Keith think of my Honda X-Adv? MCN Fleet: X-Adv is new Thruxton lap record holder! "A one-of-a-kind: Styled like a supermoto with wide 17-inch rims"